Acoustic foams are used independently or with a variety of surface coatings to enhance their physical performance. 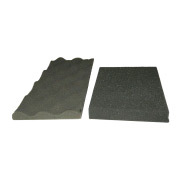 They are used in fabric covered ‘PQ Panels’ for reverb absorbtion and also used in combination with barrier and damping materials to provide high performance noise treatment to engine bays for example. Sonafoam is combustion modified and will not self ignite . Sizes: 6, 12 and 25mm thick, 1400mm nom width. Facings: Sonafoam can be supplied with fire resistant foil facing and also with a pressure sensitive adhesive (PSA) backing if required. Surface shape: Sonafoam is typically supplied with a flat surface, however a 25mm thick version is available with a convoluted (egg crate) surface on one side. (Sonafoam 25C). *Please note these results are typical for plain (unfaced) foams and results will differ if foil faced or laminated products are tested.